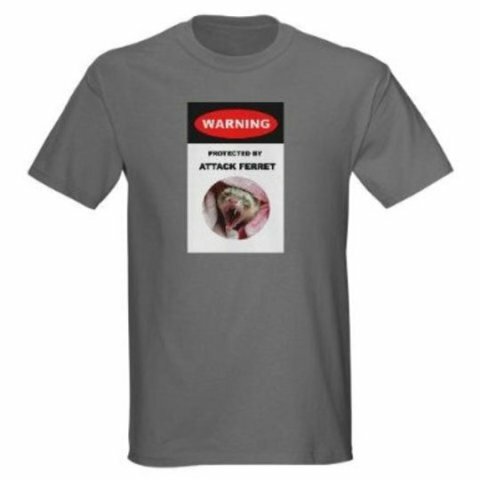 The whole world will know not to mess with you when you are wearing this funny "Warning: Protected By Attack Ferret" t-shirt! There is even a picture of an angry ferret to demonstrate the danger. It is also a great way to show your ferret-lover's pride while giving the people around you a good chuckle. This cool and breezy 100% pre-shrunk cotton t-shirt is durable enough for years of fun. A cool gift for that ferret lover in your life. Available in black or gray in sizes up to 3X. For more information or to order, click here.